Besides the startups from the current SpinLab class, a few others, selected from the Central German academic initiatives to promote entrepreneurship, were given the opportunity to introduce themselves to the investors: exist, SAXEED, SMILE, Thüringer Hochschulnetzwerk and univations. 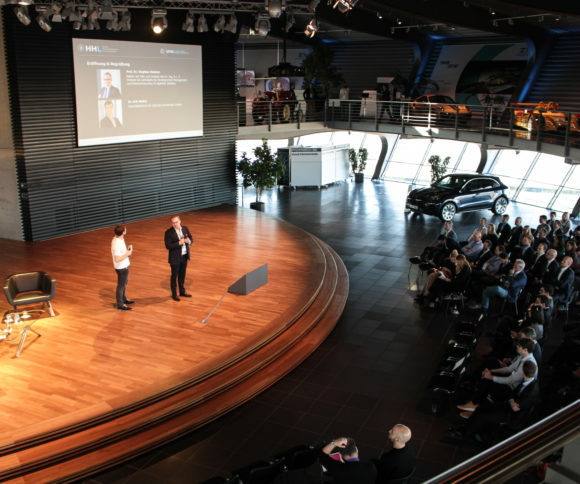 The Porsche Customer Center, where every startup had its own booth, provided the perfect stage for the founders and the representatives of the various investment companies to talk and share views throughout the day. The startups also had the chance to win an award for the best pitch where both a panel of experts and the audience got to vote. Keleya, the “digital midwife for expectant mothers”, received the award for the best SpinLab pitch as well as EUR 5,000 in prize money from the City of Leipzig. Morpheus Space, a company developing and producing electric micro-engines for small satellites, won the award for the best pitch by a Central German startup with a monetary reward of EUR 1,500 from Karl Kolle Foundation. Is AI the future of VC? During the first panel discussion, representatives from various venture capital (VC) companies discussed the potential and risks of using artificial intelligence (AI) in automating the identification of promising startups. Despite some doubt, the participants repeatedly confirmed a meaningful evaluation is probably possible if based upon the right data. Karolina Kukielka (InReach Ventures) commented, “The greatest challenge for us is working with the data. That is why the process of building our AI has been dragging on. However, once we have found the algorithm, we will take a huge leap forward.” Daniel Höpfner (B10.vc) also pointed out that a new solution as an alternative to manual scrolling needs to be developed in light of the increasing density of startups. B10.vc, for example, tries to approach startups using an AI-based ecosystem. During the first keynote address of the day, Ashley Lundström (EQT Ventures) showed how an AI can be built successfully in the field of VC and introduced Motherbrain, the AI platform of EQT Ventures which aims to reduce millions of startups down to a handful of particularly promising ones. Ashley Lundström also talked about how Motherbrain became a fixture in her everyday life and how she increasingly relies on the futuristic-sounding AI. Motherbrain has already produced its first successes but the project remains an ongoing process as the most important aspect in developing an AI is to maintain the feedback cycle and to continue to refine and improve the system in real time. This procedure enables expansion of the knowledge in people’s heads into the system. When asked by a member from the audience, Ashley Lundström also confirmed that the data situation needs to be right to be able to use AI in a meaningful way. According to her, the principle of “Garbage in, garbage out” always applies. The bottom line is that it seems difficult to forecast if and how strongly the modes of operation in the field of venture capital will change; traditional VC companies will have to face young AI-based businesses in the race to discover the most promising startups as early as possible. However, the limited data situation and the soft factors, which are difficult to analyze, continue to be a weak spot for artificial intelligence, which is otherwise progressing rapidly. The second half of the program focused on the field of tension between public subsidies and private venture capital to cover the funding needs of startups. With his keynote address, Jörg Rheinboldt (APX) provided an introduction to the topic by highlighting the benefits and drawbacks of both sources and explaining that the question of “VC or subsidies” is at the discretion of each and every startup and founder — like so many entrepreneurial decisions that need to be made. He listed the time required for the application, management structures for the funds and the accompanying formalities as well as what networks and contacts they might open up as some of the factors which should be considered in this process. Isabelle Canu (Coparion), who works in the allocation of state subsidies herself, considers the field of tension between market proximity and social contract as the key challenge in public funding. She underlined how important it was not to distort the market to avoid a counterproductive “bubble” around the subsidized startups. Subsidies should only be granted where the market has failed. Reinhard Flaskamp (Sächsisches Staatsministerium für Wirtschaft, Arbeit und Verkehr) has a similar point of view, stating that subsidies and VC are not mutually exclusive but should interlink. Particularly in the eastern German states, which continue have a weaker economic structure, there is still a lot of potential to expand on this symbiosis. While the participants agreed that technologies and innovative startups worth funding are also flourishing in eastern Germany, the private financial infrastructure in the form of VS remains very weak according to Flaskamp. The geographical allocation of startup hubs in the country, however, is not set in stone. “The money chases the idea,” Andreas Winiarski (Earlybird) reminded everyone and forecasted that these hotspots will change. Moreover, Jan Alberti (bmp) pointed out the general dissolution of conventional forms of work and the increasing multi-locality of teams and startups. Teams are more and more digitally connected, spatially flexible and, therefore, represented at different locations. It remains necessary to discuss to what extent state funding, often financed through the budget of the federal governments, can adapt to these changes, prevail in this network and play a meaningful role in it. At the same time, private investors are also facing an increasingly complex ecosystem to monitor and navigate. In summary, a multi-faceted financial infrastructure is required to nourish research-based and innovative startups successfully. Investors will have to bridge the gap between patience regarding the development of new technologies and the promotion of a market-oriented founder’s mentality early enough to implement these technologies in a specific product. When which impetus is most valuable remains a matter of discretion on the startup side; just like it is a matter of discretion on the investors’ side when and how long a project is worth supporting. The scope of criteria holds the potential of public and private investors working together but also the risk of working at cross purposes or even against each other. We look forward to the next exciting HHL SpinLab Investors Day which will take place on June 6, 2019 – save the date!